Good old outback watering hole that naturally welcomes your dog to join you for a drink outside in the shaded club grounds! Important gathering place for all the locals and visitors passing by. 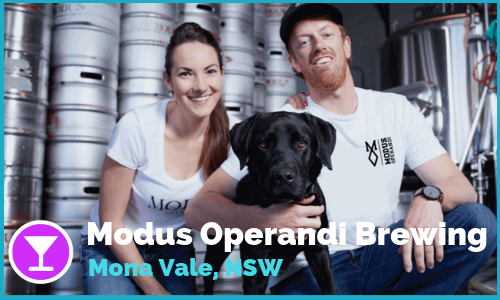 Genuine laid back dog friendly brewery in Mornington Peninsula! The way JR Brewing describes themselves “We take craft beer very seriously, ourselves not so much” just simply sums it up. Dogs are welcome at the beer garden in the front of the venue! 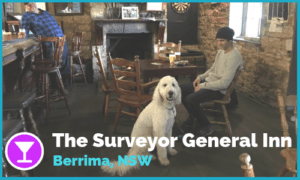 North NSW town of UKI is host to one of the most scenic dog friendly country pubs in NSW. You and your dog can sit on the under cover terrace with a drink and enjoy the view of the mountain range in the distance. Stunning beach front location makes Shoal Bay Country Club one of the finest places to wine & dine with your dog. Enjoy the fresh ocean breeze with your pup in the alfresco dining area. Willawarrin Hotel is a great little dog friendly country style pub where the banjo and guitar is played most nights. If you are looking for a pawsome atmosphere & amazing food from the kitchen with your pooch, then Willawarin is the place to visit. 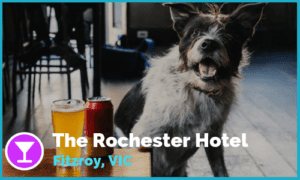 The Warren View Hotel is a dog friendly pub in the heart of Enmore. Dogs are welcome in the beer garden and bistro areas so plenty of undercover and outdoor space for them. They also provide heaps of water bowls and have cookies from Lilly’s Pawtisserie available for purchase at the bar. The staff loves their furry locals and always pop out with free treats and cuddles! Do you want to try something little different than wineries? How about gin tasting at the dog friendly Bass & Flinders distillery. Dogs are welcome in the outside area that is partly covered with umbrellas, where you can order your gin flight or just a casual drink. 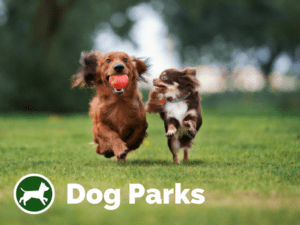 Hidden dog friendly brewery in Caringbah where dogs are welcome inside with their owners. Hairyman is on the Woolooware Bay Pathway walk so perfect for a dog walk and trip to the brewery at the end, with a drink for the owners and water for the dogs. Food trucks on Friday, Saturday and Sunday. Dog friendly brewery nestled in Mornington’s back streets is recognised as one of the best craft breweries in Australia. Dogs are welcome in the outdoor area to join you for a well deserved pint! After something more hip with your dog? 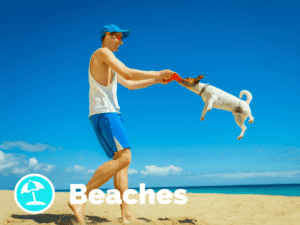 Check out this dog friendly bar right on the beach and you won’t be disappointed! Cocktails, small and large plates and of course plenty of local brews and wines. Dogs are welcome on the outdoor area at The Flat Rock Brew Cafe. It is not unusual to see locals dropping by for a craft beer pit stop while walking their dogs in the area. 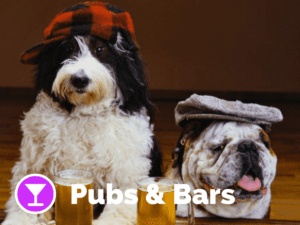 Dog friendly pub The Sackville has pretty much everything on offer; food, plenty of taps, sports, music, impressive wine list… All this to make you and your pooch (who is welcome inside as well) feel comfortable no matter what the weather brings! The Erko is a dog friendly pub in Erskineville supporting local produce and serving the local community. It was awarded Sydney’s Best Pub Food few years ago by the TimeOut! As a true Parramatta icon, the dog friendly Albion has been at the heart of the community for many years. Dogs are welcome inside and out at the Albion Hotel. Experience a relaxed atmosphere with your dog at dog friendly wine bar, Atticus. Enjoy local and regional wines as well as Yarra Valley beer and cider along with platters to share. Dog friendly gin distillery, Four Pillars Gin, makes award winning gin using orange, finger-lime, turmeric and ginger and the staff talk you through the botanicals used in the distilling process. The beautiful copper pot stills brought over from Germany to make the gin are on display and you learn how they even make their own marmalade from the oranges used in the gin distilling process. Dogs are allowed to join you for a gin tasting experience on the fully covered outside area. Discovered by Pooches & Pinot | Thanks for the pawsome contribution!! Dog friendly pub, The Scarborough hotel and its picturesque sea cliff garden is located on the beautiful northern Illawarra coast. Perched directly above the sea with sensational views along the coastline to Sydney, it is the perfect place to get together with friends for breakfast, lunch or even a relaxing glass of your favourite tipple from the bar. Doggies are welcome too at the scenic beer garden with umbrellas providing shade from the sun. The Grand Hotel is a dog friendly pub in Healesville. It is locally owned & operated and focuses on local produce, local wines, ciders & beers, showcasing a seasonal menu with something for everyone. Dogs are allowed at the beer garden and the front verandah. Iron Duke Hotel has a dog friendly beer garden at the back with some shade as well for the hot or rainy days. Grap a schooner or two of your favourite draft or craft! Dogs are allowed in the outdoor area of The Wharf Hotel with great views of the river and the South Bank. There are several umbrellas at the terrace to provide some shade to your pup. Great down to earth dog friendly pub in Rozelle welcomes your four legged companion to join you inside the front bar. Great selection of beers, good chilled vibes and plenty of locals with their pups! Dog Friendly Tilba Valley Winery & Ale house welcomes dogs in most areas on lead. It’s a family run boutique winery scenically located at the foothills of Mt Gulaga on the shores of the beautiful Corunna Lake #southcoast! Dog Friendly Cafe / Bar Diggies was opened in the restored iconic, heritage listed building – giving a new lease on life to an old friend. A stones throw from Puckey’s 24h dog beach the bright, casual cafe with open windows overlooking North Wollongong beach is open for brekkie, lunch and easy dinner. Dogs are welcome to join in the courtyard. Old Dog, New Tricks! That’s how the saying goes in this super dog friendly Newtown establishment. Even their logo is clearly indicating the love of dogs in Botany View Hotel. 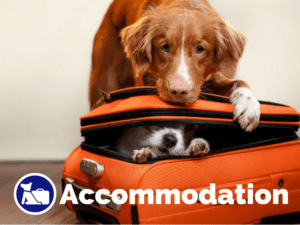 Dogs allowed everywhere (inside and outside) so make sure you’ll go an check this place out when exploring the trendy hoods of Newtown! An iconic english style pub that was once the first bank in Katoomba. The Old City Bank Bar welcomes dogs daily after 3pm (when the food service is finished) into their beer garden. Beer Garden is not completely in shade but it has a great atmosphere to go for an after hike drink with your pup. Dog friendly pub, The Park House rising from the ruins of the Mona Vale Hotel, is an all-new multipurpose dining and social space, dramatically reimagined to match the neighbourhood’s exciting evolution. Friendly staff welcomes you and your pooch anywhere in the outdoor areas and is always happy to bring water for the thirsty four legged guests. Outdoor area at the back also has an automatic roof that comes on if the sun gets a bit too hot or sudden rain drops start threatening you.